February is an exciting time of year to be in Kingston. There are a ton of scheduled live music events happening in the city. Some of the most anticipated events are those for Bob Marley Birthday celebration. When Jamaica celebrates its biggest icon and we go all out. 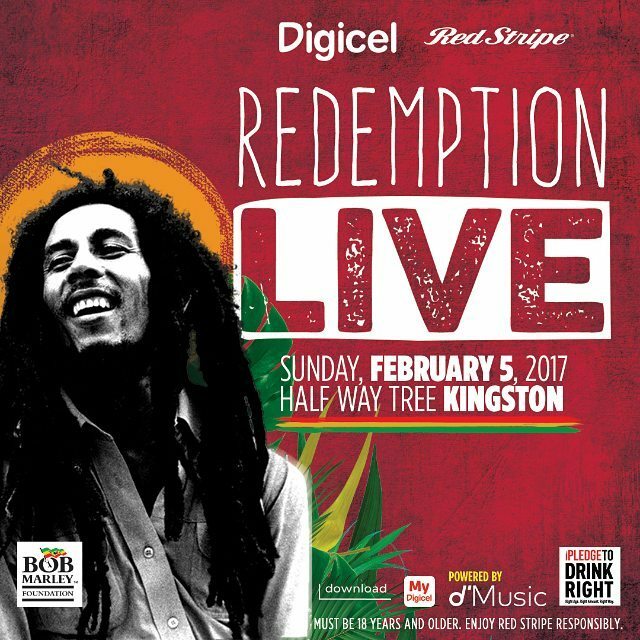 On Sunday February 5, Digicel will host it’s annual Redemption Live Concert, which is one of the official Bob Marley Birthday celebration events. As per usual, the event will feature an impressive pool of talented recording artistes. Kymani Marley, Jah 9, Capleton, Beenie Man and quite a few others are scheduled for the show. The concert will be held at 6pm at the Half Way Tree Transport Center. General Admission is free , however you do need a ticket to get in. Tickets are available at select Digicel Stores islandwide. They also have VIP tickets available for a contribution of J$4000(US$32). Proceeds will go in aid of the Eira Schader Home for the Aged in Trench Town. Check their facebook page for more details. On February 6, Bob’s actual birthday, the Bob Marley Museum in Kingston will have day long celebration. There is the day customary drumming at 6:30 by Nyabinghi drummers and activities scheduled from 10am to 10pm. In addition to being the start of Reggae month and Black History month, February 1 is also a day that we celebrate another Reggae legend, Dennis Brown. The crown prince of Reggae throughout his stellar career recorded over 75 albums, leaving us with a host of timeless hits. His birthday usually lacks the fanfare of Marley but still worth celebrating nonetheless. There will be an event in the Half Way Tree to celebrate today as well as to kick off month long events and activities to celebrate reggae music. Janine Cunningham aka Jah 9, is one of the named ambassadors for the 2017 Bob Marley events . She recently launched her album “9” and will be performing live in Kingston on February 11 alongside her band, The Dub Treatment. Other guest artistes appearances are expected . For more info on the Dub princess check out her website www.jah9.com . The Jamaica Reggae Industry Association has issued a calendar of events for the month. Some events like Dub Club and Weddy Weddy ,are year long staples on the entertainment calendar. If you are interested in the business side of the music and current happenings then you can pop in on one of the Open University sessions at Edna Manley College each Thursday. The bulk of the events are scheduled in Kingston but there is a concert in Negril on February 14 and a few other independent events across the island. If you can’t make it to Jamaica this month , there are activities happening all over the world to celebrate Marley’s birthday and reggae music. So far I’ve seen posters for concerts in Dubai, London , South Africa and Germany. Search on social media for events or good old google to see if anything is happening near you. There are very few places in the world that you can enjoy world class live music events for free or at a minimal contribution. I am super excited for the month ahead , let me know if you make it to any of the events. You can comment below or reach out on facebook, twitter or instagram. Previous Previous post: Rebel Salute 2017 is here!